Half time maid and security guard at night. Mobile phone with local number provided. The villa lies nestled in the heart of the Batubelig area, 10 minutes walk to the beach (and its magnificent sunsets) and just a few minutes drive from the shopping streets of Seminyak, the trendiest area in the southeast of Bali. Once you get past the front door, you will discover a charming tropical garden bathed by the sun. In the middle of it are a wooden pool deck and the swimming pool, where you can alternate refreshing bath and relaxation times in the sun loungers. On both sides of the pool are the two buildings that make up the villa. In the smaller one, theres a kid-room and a double bedroom with its en-suite open bathroom brightened up with an exotic garden. Both bedrooms are air conditioned. The main building includes an air-conditioned double bedroom with TV and en-suite open bathroom brightened up with an exotic garden, a kitchen fully equipped and a living / dining room. At ease in the sofa, you can enjoy all the modern comforts (LCD TV, Home cinema, wifi etc ...). This villa is ideal for those wishing to stay in a quiet area while being close to the sprightliness and the shops. You will be indeed only few minutes away from restaurants and boutiques of the famous Jalan Oberoi, the fashionable place of Bali. Villa Calypso is located in the heart of Batubelig area, where there are plenty of famous restaurants especially the Wild Hog for its ribs and the Watercress for the coffee and healthy dishes. 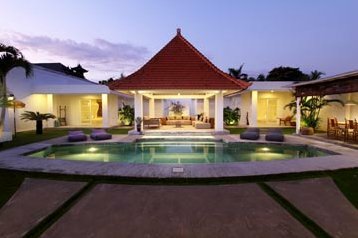 This vacation rental offers you also the proximity from the Seminyak shopping streets, the seaside resort of Bali, and from The Batubelig beach, well-known for its beach front bars and its fabulous sunsets. In other words, this villa is perfectly located! As you enter to this little peaceful haven, you will discover a pretty tropical garden with a large wooden deck framing the pool that will offer you relaxing moments every day. An outdoor setting featured for our guests who wish to enjoy their breakfast after morning swim or who crave for dinner under the moonlight while enjoying the soothing Balinese atmosphere. The spacious living room designed and constructed in an open-air style covering kitchen and the sitting room, offers you a comforting view of the lush garden. Feel the vibe through the colorful and sophisticated decoration and let yourself be pampered by this peaceful holiday place. Both bedrooms are giving the view of the wooden deck and the pool. 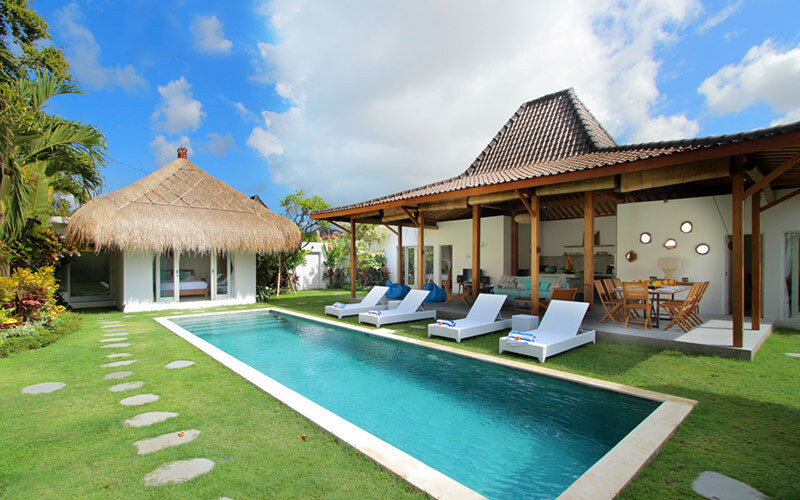 Each has a private semi outdoor bathroom immersing you in an exotic Balinese environment. Make your dreams come true and fly now to the Isle of Gods! You have review for Villa ricci-calypso?